The classic all american pull toy has been a staple of the woodworking community. Try this quick afternoon project that even a beginner could build. You might want to drag the kids into this one as well. 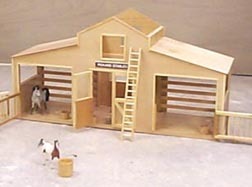 I made this barn for my horse loving granddaughters. I looked at lots of pictures and came up with this design. Here's another free woodworking plan from Shopsmith HANDS-ON. They always have great plans for all skill levels. This one is for the classic kids game called pecking chickens. Just pull the cord and watch them move. According to this free woodworking plan, this project will take you 3 hours to complete. This is a perfrect project to schedule for a saturday afternoon of woodworking. Try to get the kids involved and build this one with them. I've seen these at the craft shows and I've always wondered how to build them. Well, here "ya" go. Try out this simple and free woodworking plan and you might end up selling them at your next craft show. This is a woodworking classic project. The Classic Wooden Wagon that even has home made wooden wheels. The plans make look old but the are very detailed. It is missing the assembly instructions, but I think any average woodworker could figure it out. Enjoy this free woodworking project.